Spirals & Spatulas: The Piano Room! Since we're moving from a 1100 square-foot apartment to a 2600 square-foot house, the house has a lot of empty space. We're planning on filling it slowly (and a couple of the upstairs rooms will probably just stay empty for a while), but we want to get the rooms that are really visible from the front door decorated first. Right when you enter the house, the "study" is on your left. I didn't really want to make the room a study because a) we have plenty of rooms upstairs that could serve that purpose, and b) I don't want the first thing you see when you walk in to be a computer and lots of office supplies. 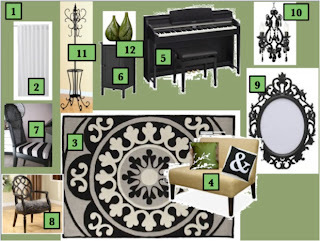 I loved the classic, clean look, and the black and white would be perfect for the piano room! 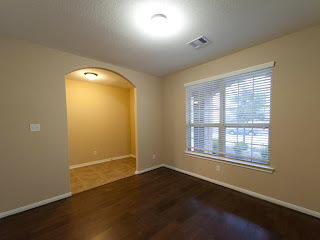 Our floors are already deep brown hardwoods, and the walls are already tan with white trim. It would've been so easy! However, when I showed it to Jeff, he was less than thrilled. He likes colorful rooms, and what looked "classic" to me just looked boring to him. Also, he apparently thinks animal prints are tacky and weird, so the zebra rug was out. We bounced ideas back and forth for a while before we ended up with a general concept for the room that we both really like. 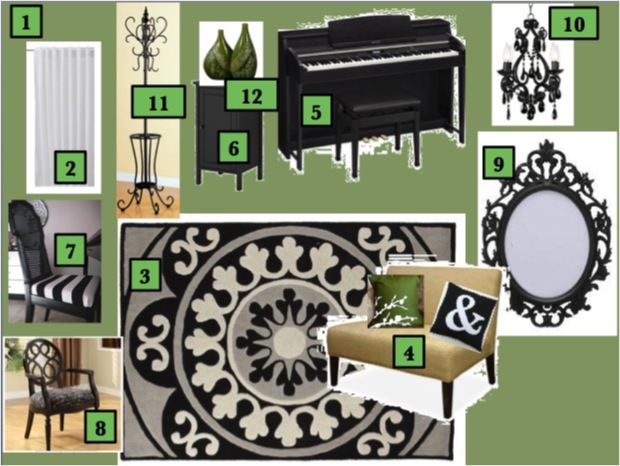 Presenting... the piano room inspiration board! 1. We're going to paint the room a muted green, being careful to avoid guacamole-esque colors and lean more toward gray-ish green. 2. White curtains from Ikea! They're cheap, they're longer than average curtain panels (for high hanging! ), and they come with super-simple iron-on hem tape. 3. This 5x7 rug from Target! 4. The Dolce Loveseat (also from Target). It's small but substantial, and I've been in love with it ever since I saw the chair version on Young House Love. We're going to add some green, black, and white pillows like these two from Etsy. 5. Our piano! It looks pretty similar to this one. 6. Our black Hemnes cabinet from Ikea. We already own this and use it to hold all of our sheet music. 7. A refinished vintage chair! This isn't actually the chair, but it's an inspiration picture for what I want to do to a chair that I recently purchased off of Craigslist for $20! A little black paint, a little bold fabric on the seat cushion, and we'll be good to go! 8. A second chair. I love this one from Overstock, but I might try to find a second Craigslist purchase instead. We'll see. 9. I'm dying to put a black gilded-looking mirror on the wall. This frame from Ikea is kind of perfect, but we'd have to get a mirror put in it. What I'd rather do is find a gold-gilded mirror at a thrift store or something and re-finish it in black. 10. Black chandelier. This one from Amazon is cute, but I still don't think I've found the perfect light fixture. We're working on it! 11. Coat and hat rack!! I actually saw some of these at Marshalls HomeGoods the other day for $40, and I might go back and get one. This one from Overstock is good too though! 12. Pops of green with vases and such, like these from CSN stores. Unfortunately, we just spent a lot of money on buying the house itself, so we don't have infinite funds available to furnish the rooms in the house (it's the most frustrating thing about buying a new home!). We'll probably start with the rug, chairs, and loveseat (along with the piano and cabinet, which we already have), and then wait a bit before we do anything else. What do y'all think? Anyone have a suggestion for the perfect muted green paint color? I love the inspiration board! That's so pretty. Do you guys have paint matching there? I know here in Canada if you bring in anything that has the colour you want they'll custom mix it to match, and you only pay if it's right.